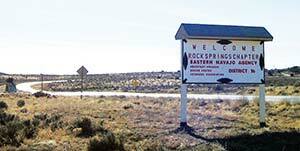 TOP: A new sign welcomes visitors to Rock Springs Chapter, just north of Gallup. Although the chapter has both springs and rocks in abundance, the origin of the name “Rock Springs” is unclear. 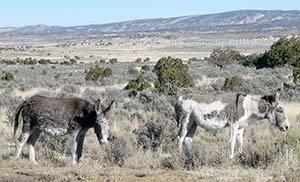 BOTTOM: Burros graze along a road in Rock Springs Chapter. Though just a few miles from Gallup, the chapter has a surprisingly rural feel. If Rock Springs were not on the reservation, it would be where wealthy Gallupians chose to live. They would build luxurious solar-powered homes amid the intricately weathered blond sandstone crags, and lace the piñon-juniper forests with hiking and horse trails. But Rock Springs -- except for some large, checkerboarded chunks -- is on the Navajo Reservation, and despite its proximity to Gallup, which abuts its southern border, it looks it. There's a big "closed" sign on the chapter house as it awaits remediation for mold and asbestos; aging two-bedroom mobile homes house multiple families; the Head Start is closed awaiting qualified personnel. "Everybody thinks that, being so close to Gallup, we get some help from them," said Community Services Coordinator Brenda Wero. "We don't." Instead, Navajos heading back to the rez from shopping trips dump their trash here. Although Rock Springs is within McKinley County, the county commission bristles when the chapter asks for help maintaining its roads, Wero says, and charges a fee. So convenient is the city that nobody thinks of starting a business here, even though the chapter comprises prime real estate at the junction of Arizona Highway 264 and U.S. 491. Basically, Rock Springs is a suburb without any of the attendant privileges. "There are pros and cons" to being so close to town, says Wero. Unlike on most of the rez, the teenagers are not bored. They belong to sports leagues or drive in to Gallup to cruise the mall or catch a movie. That is why you don't see much graffiti here. That and Billy Yazzie. The septuagenarian heavy equipment operator, said Wero and the chapter's secretary-treasurer, Eleanor Jones, cannot stand graffiti and keeps a can of paint on hand to whip out the minute he sees gang tagging. Name: The chapter has a lot of interesting rock formations, including some that are considered sacred sites, and also some nice springs. But Chapter Secretary-Treasurer Eleanor Jones, who hails from here, says she has yet to find an elder who can tell her definitively how the chapter got its name. The name of China Springs, a community within the chapter, is easier to trace. "They say the Chinamen who built the railroad used to camp there," Jones said. Famous residents: Former McKinley County Deputy Sheriff "Bobcat" Wilson, who was wounded in a 1935 confrontation between rioting coal miners and law enforcement, had a ranch within the chapter boundaries that is still in his family. "He's not one to stay within his job description," laughed Wero. She and Jones, along with the rest of the current chapter administration, get their laughs where they can. They are working hard to stay positive. They have some big plans for this high-potential gateway to Gallup, but they are still digging out from under the financial rubble left by the last administration. In an audit of the 27-month period ending Dec. 31, 2012, the Navajo Nation Auditor General found 19 financial violations, including lack of documentation, favoritism in doling out chapter services, inappropriate expenditures and unjustified travel. The auditor described Rock Springs' filing system as being "in disarray." "One by one," said Jones, "we're addressing all the findings." The problem is, the citizenry has gotten pretty used to undocumented handouts, and Jones and Wero spend a lot of their valuable time playing bad cop. "Every chapter meeting, it's the same people saying, 'Why can't we have this? Why can't we have that?'" complained Wero. "I tell them, 'OK, if you want to go back to the way things were, we can do that. They'll come and take all the money and hold it in Window Rock. Is that what you want?'" Jones and Wero are committed to handling the money by the book, and they back each other up. Once it gets the all-clear from the auditor, Rock Springs should have no problem getting certified ... if it wants to. It would seem like a no-brainer for this suburban chapter to claim tax revenue from the gold mines within its boundaries, like T&R Market and Gas Max. But alas, those are on private land. "The way we are now, certification won't do us any good," Wero sighed. "T&R and Gas Max pay their taxes to the county." The chapter is in the process of withdrawing 80 acres along Highway 264 for business sites -- the women think a child day care would fly, with parents dropping off their kids on their way in to work in Gallup. But they're holding their breath that the low-lying site won't be declared a flood plain. "We need to get an engineer out there to take a look at it," Wero said. scattered-site or cluster NHA housing. A surprising number of Rock Springs residents are without electrical power, since the area is so checkerboarded that running power lines across three or four jurisdictions is prohibitive. The chapter is experimenting with offering its more isolated residents off-the-grid solar panels. "We'll see how it works out," Wero said. Meanwhile, a lot of residents have decent jobs in Gallup and do for themselves, although the well-paying coal mine and railroad jobs that once sustained this blue-collar community are on the wane. More and more young people are scrambling for tribal scholarships to get into the University of New Mexico at Gallup. "A lot of them are going into the health care field, since that's where the jobs seem to be these days," Wero said, adding with a smirk, "Maybe I'll go for my RN and not have to deal with all these audit findings." Lest her detractors start taking up a collection for her college fund, she quickly added, "No, I'm not going anywhere until we get all this stuff figured out." This led Jones to breathe a sigh of relief. "I'm really thankful to Brenda," she said. "She stands by policy." "We're a growing community," Jones said later. "I'm hoping for the best, and trying to do what's right. I think so far we're doing pretty good."